A few days ago carpet tile samples arrived for the sixth iteration in my Vowel series »Kihi/Kiss« a 15-metre long carpet section for Wellington Airport’s main lounge, designed back in 2015/2016 when, “... if it’s not a pocket-sized park, it’s a 400 page book, if it’s not a 400 page book, it’s a bespoke display system, if it’s not a bespoke display system, it’s an airport carpet, if it’s not an airport carpet, it’s another vowel installation coming on [»Collidescape«] ... everything now!”, posted on IG, 27 March 2016. On top, the night Awoiska van der Molen launched Bruce Connew’s book »Body of Work« at The Keep, Prince died ... and a few months later I found my Māori whānau in Oparure ... Make what you wish of all this, but »Kihi/Kiss« pays attention to these moments of intersection — not out of place in an airport lounge. Now in production, and another year I’m told, before the terminal’s main lounge will be ready for installation of the final work, these samples show a 1.2m section of the whole, my composition blended into the base pattern. Wellington International Airport was designed by Warren and Mahoney as a southern extension to the main terminal building to accommodate the increased passenger numbers in and out of Wellington City. Design highlights of the building include the large scale custom laminated structural timber frames, fitted in a cross hatched style pattern and the vibrant custom designed carpet tile artworks featured throughout the building’s interior. 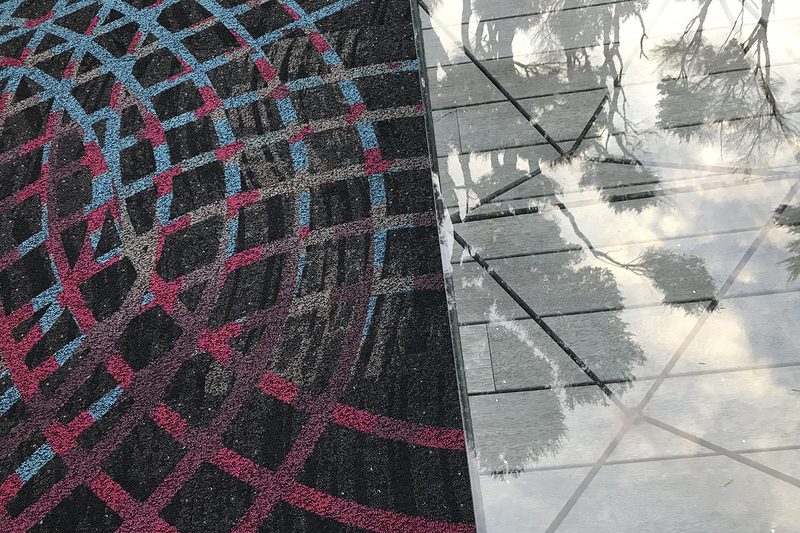 Ontera collaborated with Cato to develop a main carpet tile design that connects the overall building’s floor layout. 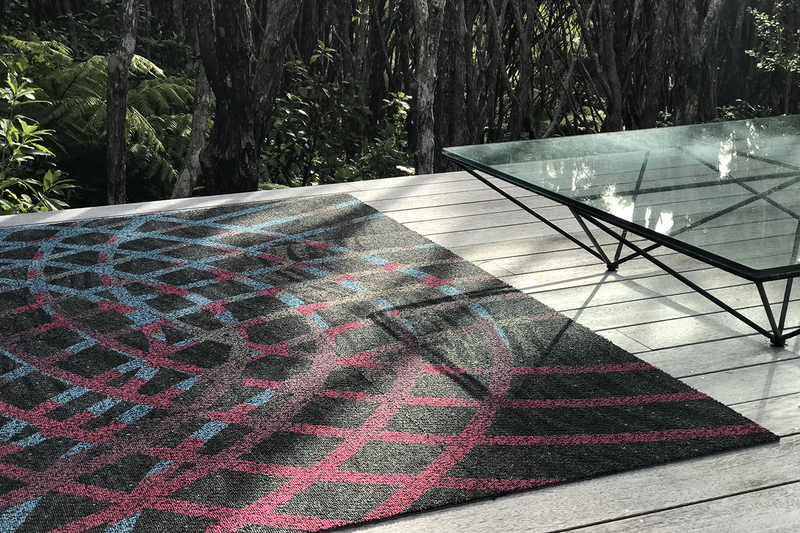 The carpet tile artworks incorporate the work of well-known Wellington artists, Sam Broad, Timon Maxey, Rachael Gannaway and Catherine Griffiths, showcasing different perspectives and interpretations of Wellington through their eyes. Ontera had the challenge of executing each artwork into a carpet tile design layout. Each artwork was split into multiple individual carpet tile designs in a grid format, similar to a jigsaw puzzle. Each individual section of the design was then technically prepared by Ontera’s design team based in Sydney with the pieces carefully put together to make up each larger artwork piece on installation. Ontera Colourweave (Custom) was specified by Warren and Mahoney for the application. The sixth in an ongoing series of Vowel works, »Kihi/Kiss« is a 15 x 5 metre artwork blended into the base carpet of the main lounge in Wellington Airport’s domestic terminal, Aotearoa New Zealand. Several other artists were commissioned to make works which are located in other areas of the new domestic terminal extension. Designed back in 2015/16, »Kihi/Kiss« is the last work to be installed.